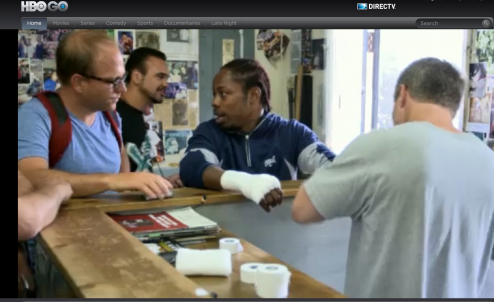 I make an appearance in Episode 3 of “On Freddie Roach.” It’s a Peter Berg documentary about the great boxing trainer Freddie Roach. It’s on HBO. That’s me. The dude on the left. Kind of a badass, aren’t I? And I think Kevin Durant copied my backpack look. This entry was written by Poole, posted on February 7, 2012 at 12:11 am, filed under Boxing. Bookmark the permalink. Follow any comments here with the RSS feed for this post.